The reporter and ‘riding instructor’ make it sound like the second rider made a deliberate choice to lay down the second bike. I agree with you that it’s total BS. He panicked and locked up that wheel well before he reached his buddy on the roadway. He had an opportunity to see the dog darting in front of his buddy from a greater distance and had more time to respond by braking and steering. There was room to the right of the fallen rider to get around. As for the first rider, it could have helped if the lead rider would have thrown out leg or arm or some other caution to slow down. His view of the dog was partially obstructed. I would not say the first collision was unavoidable but it may have been more difficult to avoid because he didn’t pay attention to the cruiser brake lights ahead of them that just passed the dog. There is 3rd video of this accident. https://youtu.be/1Q6mRPP1_58 Freeze frame this at 20 seconds and you’ll see the DRZ skidding the front tire with the rear in the air. The rider with the camera has time to stop before hitting the rider in front of her, but then hits the rider who hit the dog. For rider of the DRZ: on a dual sport like the DRZ the rear brake is large part of minimize your stopping distance. It appear there was still room with he went down. Also note the clear visible firearm on the downed rider’s hip. I’m presuming this is a loaded weapon (or what’s the point of carrying it?). I’m not a firearms expert, but this seems like a questionable decision on the rider’s part: best case falling a hard metal object, worse case unintended discharge. If he was wearing a proper holster with retention there is a really low risk of it coming free or discharging. Motorcyclr cops have a weapon on them everyday. Carrying on a motorcycle is not a poor choice. I would rather be a warrior in the garden then a gardner at war. I don’t have a problem with some one carrying while riding. However,I would much prefer to crash-land on proper hip armor than a 9mm Glock! That would only add to the bruising. Ouch! You can’t avoid what you don’t see coming. Reading the surroundings constantly may her given the tail rider a bit more time. That “grab ‘ of the front brake suggests he was caught by surprise . (Retired Lee Parks Total Control Instructor and site manager). In addition to correctly calling BS on the “laid it down” excuse, I put further blame on the group’s riding in staggered formation. If we believe that a certain position within one’s lane (left wheel track, center, or right wheel track) is for any given situation the preferred or correct position to maintain, then if a group assumes the full-on goose-step locked stagger, half of the riders will by default be forced to ride in the wrong part of the lane. Ken’s suggestion that the staggered formation be modified to just a slight offset from the rider in front to allow visibility ahead is a much better option for highway riding than a total right lane/left lane stagger. This way it is much easier to maintain situational awareness (i.e. better visibility) and also permits each rider to correctly maintain a 2-3 second following distance. Too often the formation tightens to allow a scant 1-second following distance behind your wingmate in the opposite lane; if he needs the entire lane suddenly, you’re all over his rear end with severely reduced options. Ken, looking at the videos, I don’t really see anyone wearing proper gear. Looks like the girl rider is wearing a sweatshirt and mechanics gloves, the guys are all wearing sneakers and jeans, one sneaker which came off when he went down is still in the middle of the road. They could all use an “accident scene management” course. Definitely could have been much worse and I hope they all learn something from it. Odd part, it seems as if the two guys that crashed the hardest would have got away with no or few injuries if he didn’t get run over my his friend. Small dog… why even brake at all? Since misapplied braking is the culprit here, a small dog soft tissue and small bone structure would have been just bump in the road… to some it may sound cruel. I’ve hit a squirrel and a big possum no big deal it’s not like hitting a solid object like a brick or curb. This seems like a panic chain reaction of bad judgement. BTW don’t know of any modern firearm that would fire a round if dropped or even slammed to the ground unless of course it was Japanese Nambu from WW2. Anti-gun mythology. 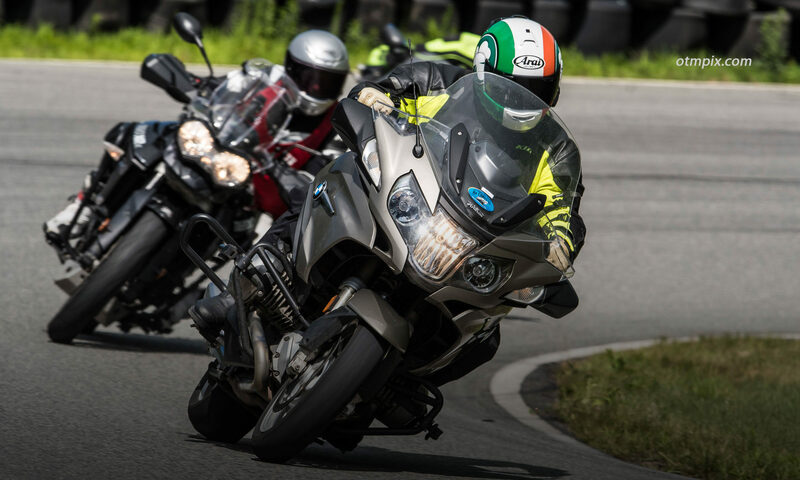 I have taken several riding instruction courses and even a non-sport track day in order to learn and practice what I need to know to be a safe rider. I have never, ever been told or shown how to “lay a bike down”. Grab lots of front brake and lean? How? When? My point is these situations call for immediate responses, something practiced before. Just where is the knowledge or memory of a “lay down” is going to come from? Nice job Ken with the breakdown, it all happens so fast. Glad that everyone was ok. As for the gear worn, I’ve seen much worse, unfortunately. The BS comment is classic and the intentional laydown is just an excuse. Get some training!! J. Note also that the second rider was riding (at that very unfortunate moment) on the road middle paint! That did not help in providing traction for braking. I would say that guy was pretty lucky to not be apple sauce on the lorry windscreen.